This collectable set includes three of director Chan-Wook Park's most celebrated films; his vengeance trilogy. Although the films do not follow on from one another, they have the same central theme at their centres; retribution and its effects on both the victim and the aggressor. 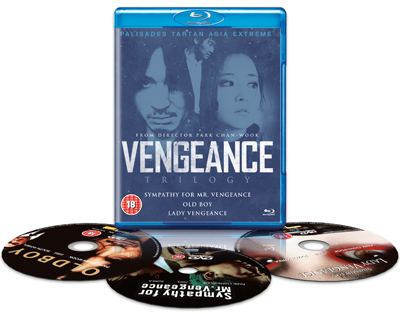 This collection of three ultra-violent films includes Sympathy for Mr Vengeance, Oldboy And Lady Vengeance. Geum-ja Lee (Yeong-ae Lee) is a young woman who works for underworld crime boss Mr Baek (Min-sik Choi). Taking the fall for the abduction and murder of a child, Geum-ja is sent to prison at the age of 19. When she realises that she has been framed by Mr Baek himself, she spends 13 years in prison planning her revenge. On her release, she exacts her vengeance against Mr Baek's goons, before a final confrontation with the mentor who betrayed her.